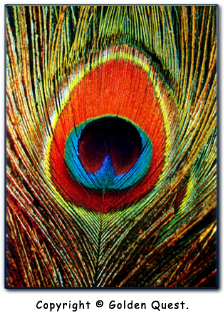 The eye of the peacock feather on the back cover is to be used for a concentration exercise. Look at the feather's eye without tension. Observe how long you are able to keep the mind one-pointed without wandering. Never strain. Do this exercise for only a few minutes once a day. Relaxation is most important.